The long road south from Matera was probably not the most scintillating of the trip – the bits we could see through the weather looked good, anyway. At best murky and overcast, the rain broke one of our golden rules and pushed us onto the Autostrada for much of the way to Tropea. Our only stop in Calabria, and in effect forming the cuticle of the toe-nail of Italy, the Tropea promontory is an odd mix – Tropea itself’s a lovely little town, seemingly very popular with German tourists, and there’s some fantastic countryside, but the expensive (and utterly empty) looking coastal villages around Capo Vaticano are mixed in with a lot of very scruffy and depopulated agricultural not-very-muchness. We only intended to do a one-nighter here, breaking the journey towards the boat for Sicily, but we ended up staying a week. 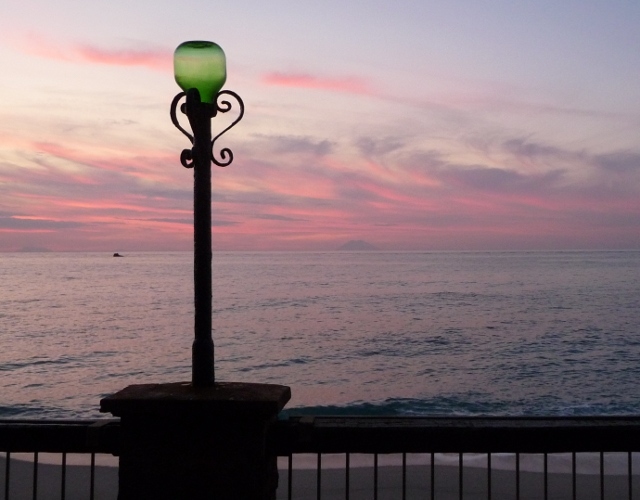 Costa Verde was a very pleasant site, right on one of the best beaches we’ve found for a long while, and with fantastic sunsets over the hazy silhouettes of the Aeolian islands. The sea itself was clean and clear – and (just about) warm enough that early morning swims were irresistable. The rental cabins on the site were buried behind lush tropical vegetation – as the bananas started to ripen, the foliage and flowers cast a shadow of scent across the site. Fortunately, the same can’t be said of the sanitary facilities, despite the thankfully so-far-unique combination squat toilets and showers. No, really. Let’s just say that you did not want to drop the shower gel. There was, fortunately, one small hut in a corner, presumably nominally the disabled toilet, with a full set of (normal!) facilities. Some hot water might not have gone amiss, but that’s approaching fine detail. It wasn’t even as if the weather was perfect. A couple of the days were damp and overcast, culminating in the ultimate meteorological jinx – we hung two loads of washing out to dry… After a night spent with the van hung full of damp clothes, fortunately blue skies returned. 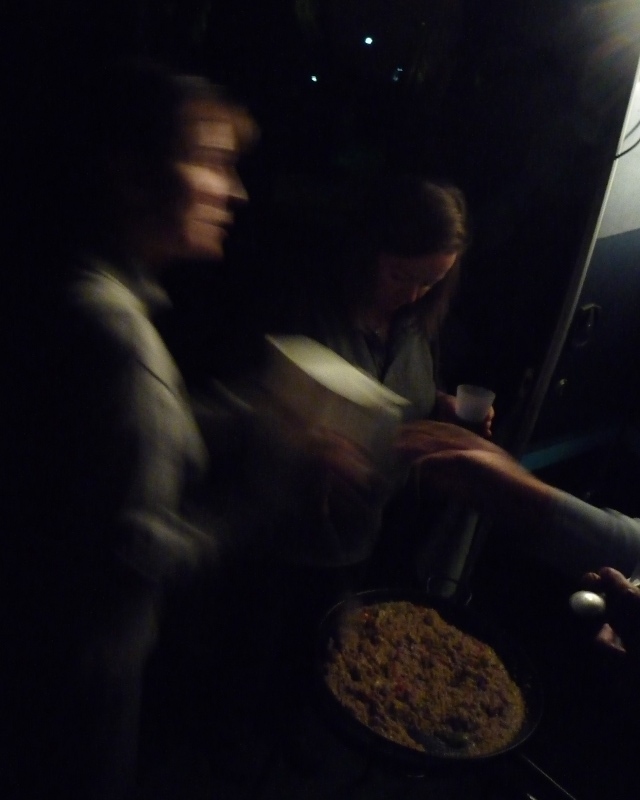 However, our renewed social lives seemed to continue apace – on arrival, we spotted Jonathan and Heather’s van, last seen in the snows of Abruzzo – their week of sea Kayaking was coming to an end, and they were heading North from here. Another set of Brits, Julie and Norman, were in a tent next to our sea-front pitch – taking a break from Julie’s smallholding and holiday cottage in Cornwall, their tent was a bit of a change from their usual more luxurious holiday choices, but they seemed to be enjoying it – despite our shared evening drinkie ending in us zipping in to the tent porch due to the rain hammering down… When Neil & Jenny arrived, they discovered the hard way exactly why the site is in the various camping guides as suitable for vehicles a maximum of 7.5m long. The steep, narrow hairpins of the entrance road forced them to do a few three-point turns in their near-on 8m long van, seemingly the front end of a Fiat Ducato mated to a tube train carriage. 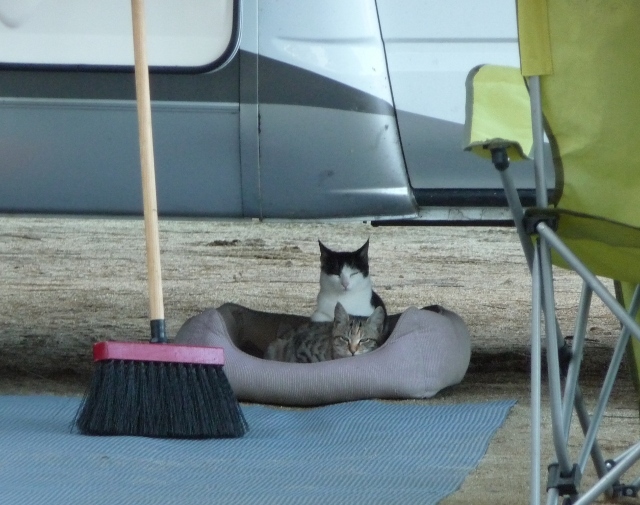 Few campsites, it would appear, are complete without a set of semi-itinerant cats, but this one excelled. At least eleven in total, there was rarely a moment when at least two or three weren’t sat around our pitch. In the pitch next to us, Nadine and Christian seemed to be even bigger cat-magnets than us. Maybe it was the occasional sneaky feeding, or maybe the cats were just enjoying unchallenged possession of the dog bed put out for their utterly unruffled Shih-tzu cross. 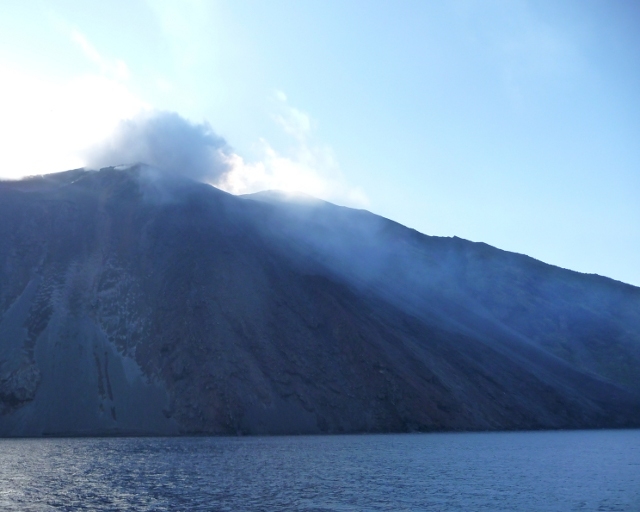 The real highlight of the stay, though, was a boat trip out to the Aeolian islands – unfortunately, the waves were a bit wobbly to allow us to land on Stromboli, but as we passed around the island, the Sciara del Fuoco lava stream steamed and smoked from the crater towards the sea. Quite why people live on a tiny island which consists only of a perpetually-erupting volcano, I’m not sure, but they do – populating the lower slopes in several places. We’re assured that the eruptions never threaten the villages, but rather them than us. Must be something to do with the islands being fantastically beautiful, I s’pose? 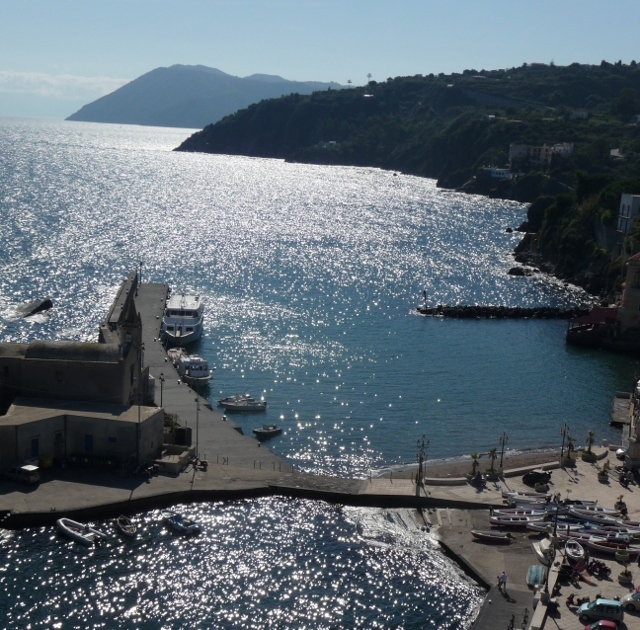 A couple of hours were happily spent wandering around the main town on Lipari, the cathedral (with wonderfully atmospheric Norman cloisters) and the remains of a castle perched high above the old town and smaller harbour. 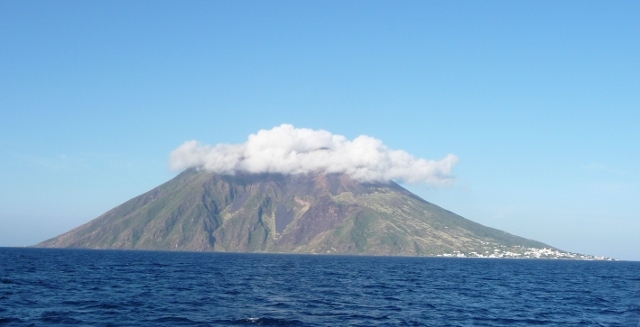 After Lipari, a stop-off on Vulcano. If we’d fancied trying the volcanic mud bathes, then the evil sulphuric odour which greeted us a distance away would have utterly dissuaded us. It lingers, apparently, for days after your wallow… For the return trip to the mainland, Ellie managed to be one of the first onto the boat, and grabbed the prime outside seats at the back. Years of experience at grabbing the last seat on a crowded Met line train, probably. A great place to watch the islands recede above the wake, as the sun gently sank towards the horizon and the spray gave us a thin crusting of salt. 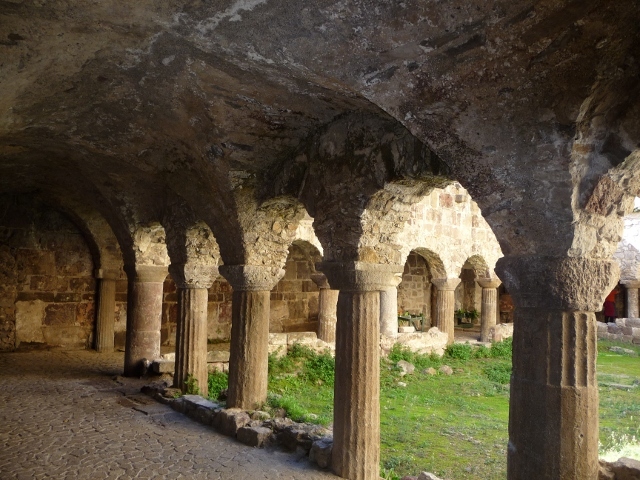 And so, finally, we headed for Villa San Giovanni, on the edge of the city of Reggio di Calabria, for the ferry across the straits to Sicily. This entry was posted in By Country - Italy, Travel stuff, Wildlife stuff. Bookmark the permalink. Hallo to the pair of you from a beautiful sunny day in Sheffield. carol and I are enjoying yor blogs and I am surpised you havent found somewhere to live in Italy, thereagain its rapidly following the Greek path down. Back for Xmas? Gawd, no. It’ll be COLD… You could always come and see us, y’know? Virtually every campsite’s got bungalows to rent. There’s a few towns that we’ve found so far and are thinking could do us for over-wintering, but today’s another blue-sky day, must be mid-high 20s here on the Southern Sicilian coast. Once again, it doesn’t seem like time to bed down for winter!